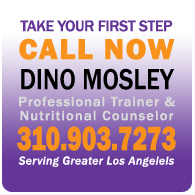 House of Fundamentals founder Dino Mosley is a Professional Trainer and Nutritional Counselor. His passion is working with clients to transform their lives through productive exercise and healthy eating. Born and raised in Southern California, Dino is the youngest of ten children. Nicknamed “Meat House” as a youngster, an unhealthy diet and bad eating habits found him tipping the scales at 225 pounds by the sixth grade. Informed by a doctor that he would likely be at risk for coronary artery disease, diabetes, and high blood pressure later in life if he did not change his ways, Dino decided to do something about it by exercising and eating right. Positive and lasting results were almost immediate. As a student, Dino played virtually every major sport, including football, basketball, and baseball. 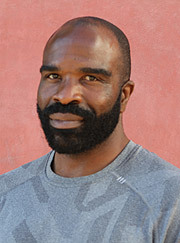 He studied both Strength and Conditioning and Kinesiology and Nutritional Counseling at Cal State Fullerton and Cal Berkley. Focusing on healthy eating and training became Dino’s passion and later his vocation. In 1994, he founded House of Fundamentals. A dedicated husband and father, some of Dino’s proudest moments come from watching clients transform and get life-changing results from their hard work.